President and CEO Buster Halterman gave the students a tour of the 7,300 square foot warehouse turned commercial-scale production facility. The group saw the quality control lab, holding tanks, and new enzymatic biodiesel technology used to convert recycled fats, oils, and grease into more into 5 million gallons of biodiesel annually. 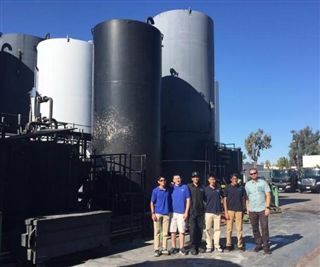 AES members are no stranger to biodiesel production - the group used saponification to convert waste oil to lavender scented soaps sold at Fall Fest and has produced enough biodiesel to run generators providing energy for Pacific Ridge's Prom and Spring Arts Festival.